Title : The Secret Dinosaur: Giants Awake! My son (7) and I (the Mom) read and reviewed this book for our website, Mother Daughter Book Reviews. Here are our thoughts. SON SAYS: This book is about a boy named Marlin who goes to the museum and finds a secret room that is forbidden. In the room he finds a special metal dinosaur called Protos and he’s special because he’s alive. He finds a bunch of other special metal dinosaurs but they don’t work. So, Marlin has to clean them and then he charges the batteries and then they came to life. Then, a T-Rex stole Marlin and brought him to the museum because the dinosaurs all thought he stole Protos’ battery. Marlin helps them find the battery. I really like the pictures in the book but since they are so good, I think you should put in more. My favorite picture is on page 72 because there’s a T-Rex with a golden head and I like gold. My favorite part of the book is when Marlin is picked up by the T-Rex and thrown onto his back for a ride because it looks like fun. I really, really liked the book and I want to read it every day. I prefer for my Mom to read it to me though. I want to read the next book for sure! I would like to give the book 50 stars, but again, my Mom won’t let me. I think kids who like dinosaurs would like this book. I also think that kids who would like to fly onto a dinosaur’s back would like this book. I think kids 5 years and older would like the story.MOM SAYS: An inquisitive and brave young boy, large metallic dinosaur robots (aka, the “Dinoteks”), a villainous museum curator, and being swallowed by a gigantic T-Rex: there is your recipe for a great adventure that tweens will love! The Secret Dinosaur is the first book in the The Dinotek Adventures. This new book series targets boys (and reluctant readers in particular) between the ages of 6 and 10. Marlin, the protagonist in the story, is a young boy whom we meet when his class takes a field trip to the local museum. Marlin wanders off and discovers a secret room filled with gigantic, life-size replicas of a variety of dinosaurs, all constructed with metal. Here he meets Protos, the Centrosaurus his uncle has been talking about, whom he brings to life with a simple repair. But sadly, Protos goes silent before long.Every day, Marlin sneaks into the museum (ok, maybe breaking into a museum is not something that should be condoned) to polish the dinosaurs and bring them back to life. Soon, Marlin discovers that their batteries must be recharged and “ta-da” – the dinosaurs all come to life; except for Protos, whose battery is missing. Marlin must work with the motley crew of Dinoteks to recover the missing battery from Mr. Grubbler, the evil museum curator who has a devious plan to sell the Dinoteks for scrap metal. All this and the author leaves us with a delicious cliffhanger. I guess we’ll have to check out Book 2, Dinosaur Chase!The Dinotek Adventures is a fun, creative story where science fiction and dinosaurs intersect. I read this book out loud to both my children in three sittings and they were completely captivated by the story. When the dinosaurs come to life and the T-Rex picks up Marlin and swallows him, the look on the kids’ faces as I read that part of the story was absolutely priceless! It sure captured and maintained their attention.I also appreciated the addition of the simple illustrations some of which were in color while others were black and white. It really helps to break up the text and helps with the visualization of the Dinoteks. I must admit that I did not visualize Flame, the T-Rex with a gold head until I saw the illustration. 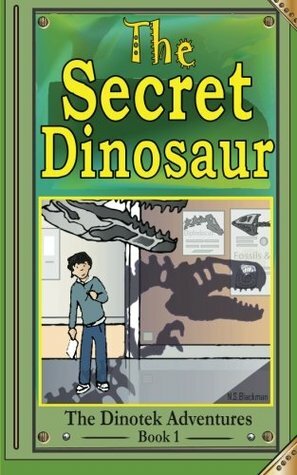 I think it is especially important for books targeting the reluctant reader audience to have at least some illustrations.My Bottom Line: The Secret Dinosaur is a fun early chapter book featuring a young boy who stumbles upon a secret; a fun and thrilling adventure; an evil villain (or two! ); and, some unique and quirky robotic dinosaurs (the Dinoteks). I highly recommend this fun new adventure series for reluctant readers who will be very entertained by this fast paced story. Ages 6 to 10. * This book was provided to us by the author free-of-charge in exchange for our honest review. This book is the first in a series of Dinotek Adventures and will appeal to children moving on to first chapter books (approx 7+ depending on reading ability) – with short chapters and lots of black and white illustrations. When Marlin Maxton visits the museum on a school trip, he goes exploring, to see if he can find Protos, a metal dinosaur which his Uncle Gus has told him about. Protos is at the very back of the Dinosaur Hall; hidden in the shadows. Marlin always helps his Uncle Gus fix things in his workshop and he immediately sets to work. To his surprise, Protos comes alive and talks to him, before falling back to sleep.Marlin is drawn back to the museum, where he comes across a whole room full of Dinotek’s – slumbering and covered with dust in a forgotten room. Can he fix them and bring them back to life before the evil Mr Grubbler sells them for scrap metal? This is an exciting read, bound to appeal to dinosaur mad kids. The book builds to an exciting climax, leading on to the next book in the series – Dinosaur Chase. This series was a big hit around here. Not only dinosaurs, but robotic dinosaurs. Very cool idea. The stories were well written & the wonderful illustrations highlighted aspects of the stories well. The Secret Dinosaur #1: Giants Awake! (The Dinotek Adventure Stories) by N.S. Blackman Children's story with few pictures about an adventure. Marlln learned from his Uncle Gus that there was a special dinosaur at the museum which his class would be visiting the next day.When he arrives with his class they are given a worksheet and he finishes fast with enough time to explore on his own. He notices many other types of dinosaurs and he does explore more and finds the metal dinosaur that his uncle told him about.What happens next is amazing-he comes to life and takes Marlin on a tour of the museum that others would never see...Later that day he talks tohis uncle and he suggests machine oil to help the dinosaurs out and he goes the next few days and they start to shine. Marlin learns what the others plan to do and he tries to talk them out of it and has to run for his life. There is an excerpt from the next book in the series at the end.Love all the hands on he learns about and the good it does. This would be a good book to read to a child over 6 years old, a few chapters a night for a week long project. This book was originally gotten for me and 6 year old son to read together. Unfortunately, it was a little too much for him to take in at this time. But, he is a little delayed in reading. I was hoping that if we did it in split sessions that it would work, but it didn't. I feel that in another year he will really be able to enjoy it. Other children his age may be able to handle it. I think it would be great for those that are starting out on their first chapter books. I really got into the story and finished it up in one sitting. A great adventure to tag along on, especially if you love dinosaurs. I look forward to reading the next installment in the series to see what happens next. Fun. Really enjoyed the dinosaurs.